Suzanne Cloutier (July 10, 1923 – December 2, 2003) was a Canadian film actress. She was born in Ottawa, Ontario. In 1952 she appeared in the film Derby Day as a maid who wins a trip to The Derby in the company of a famous film star. She appeared as Desdemona in Orson Welles's 1951 film adaptation of Othello. In 1953, she met Peter Ustinov. They married in 1954 and had three children, Andrea, Igor and Pavla, before divorcing in 1971. She died of liver cancer in 2003, aged 80. ^ a b c d Bergan, Ronald (11 December 2003). "Suzanne Cloutier". The Guardian. Retrieved 11 December 2016. 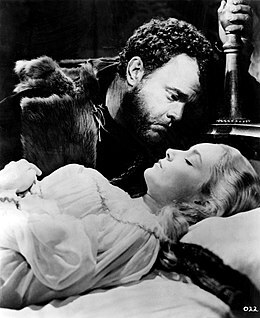 ^ "Othello (1955) Screen: Orson Welles Revises 'Othello'; Scraps Shakespeare's Plot for Visual Effect". The New York Times. Retrieved 2012-01-07. This page was last edited on 8 August 2018, at 03:45 (UTC).